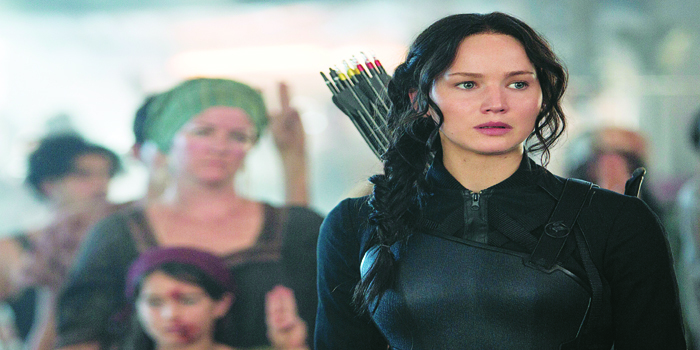 Rescued from the ashes of the 75th Hunger Games, Katniss (Lawrence) is taken to an underground rebel station. There she is persuaded by the President to take on the persona of a�?The Mockingjaya�� a�� a symbol of the rebellion. Though it is less action-packed than the earlier editions, it is a worthy sequel. This film sees writer Yudi (Khan) trying to get back to his former creative self, even as he rides high on his last hit book. But when his money runs out, he is forced to work with Armaan (Govinda) on a Bollywood script. The rest of the story is about how Yudi teams up with romance writer Aanchal (Da��Cruz) for a film. Average acting and a predictable plot make this one a no-brainer. A pre-Independence saga on the lives of theatre artistes, it captures the period feel realistically. It reflects the socio-political ethos of the era through the stage-dramas of that time. Woven in is a story of ambition and jealousy. A well-crafted screenplaya��with deft narration and a supportive technical crewa��makes it ideal fare for a discerning viewer. The actors put in their best, with Nasser towering above the rest. A crisper second half would have been to the filma��s advantage.